1.) Wash and cut apples into wedges. 2.) Set out a napkin for each child. 3.) Place two apple wedges and 6 mini marshmallows on each napkin. 4.) Fill a few bowls with strawberry yogurt. Insert spoon into each bowl. 5.) Place plastic knives between the children. 6.) Assemble one apple smile snack as shown below for the children to copy the pattern and build their own. The children love to assemble this snack on their own. Have the children spread the strawberry yogurt on the white portion of one side of both apples, this becomes the gums of the mouth. 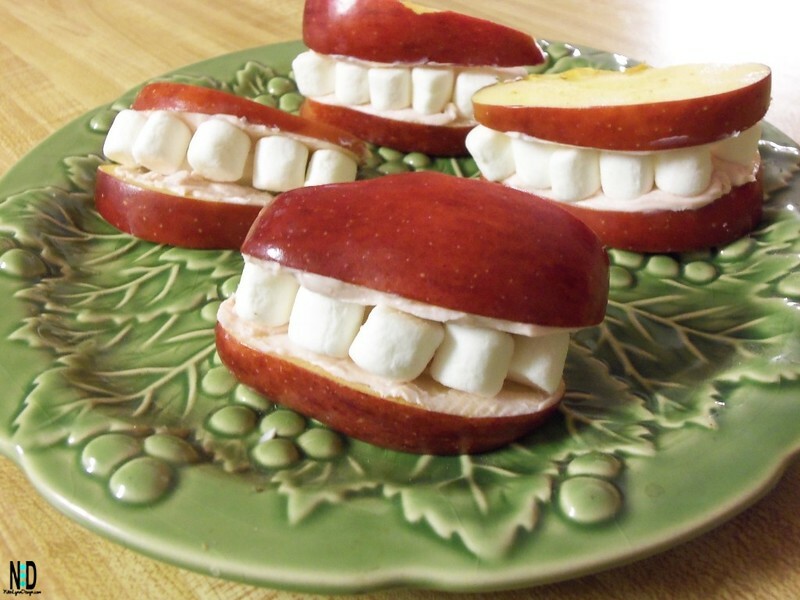 Have the children line up the mini marshmallows to create the teeth and then top with the second apple.